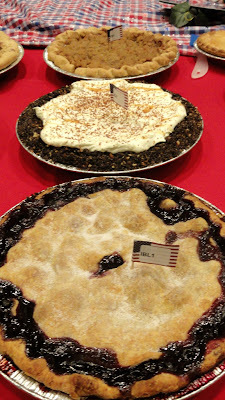 Entries in the 2012 Crisco National Pie Championship. Photo © by Judy Wells. According to the good people at the National Pie Council, January 23 is National Pie Day and I for one plan to celebrate. Here's a winning recipe from the 2012 Crisco National Pie Championships. As presented to the judges. Photo © by Judy Wells. Mix all ingredients together and press mixture into pie plate. Chill for 10 minutes. Bake in a 375 -degree oven for 10 minutes, or until brown. Allow to cool down to room temperature before filling. Beat vanilla, cream cheese, and powdered sugar until smooth. Fold in the Cool whip. Gently spread into crust and chill. * Note: Judges thought it would be even better with real whipped cream instead. Mix apple juice and cornstarch and set aside. Combine the rest of the ingredients in a saucepan and cook on the stove over medium heat until apples are appropriately tender. Once apples are tender, then add the apple juice mixture. Bring to a boil and cook until thickened. Remove from heat and cool. Double this topping, if needed. When cooled, generously top the pie with the apple topping, leaving some room for your favorite whipped topping. Top with favorite whipped cream or topping. Top with a simple granola (nuts are OK, but no fruit), to taste (Just enough to add some crunch and texture to the pie). Drizzle with caramel sauce, if desired. Chill. Is there anything better than pie?